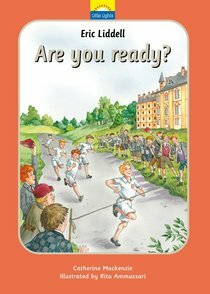 ‘On your marks, get set, Go!’ The race begins and Eric Liddell thunders down the track. The crowd cheers him on. Eric Liddell has spent months preparing himself for the Olympics. But he has also spent years getting ready to serve God. Which is more important - winning a gold medal or honouring Jesus Christ? Can Eric do both? About "Liddell Eric - Are You Ready? (Little Lights Biography Series)"
Customer Reviews For "Liddell Eric - Are You Ready? (Little Lights Biography Series)"
There is far more to Eric's story than I ever knew! The Little Lights series by Catherine Mackenzie is a series of books I have been absolutely delighted to find. Each book is written for two levels of reader, with an in-depth but kid friendly story on one side of the page and a short simple sentence summary of the text on the opposite page. The accompanying pictures are also beautiful. Prior to reading this book I had no idea Eric's parents were missionaries and that after his olympic debut, he also left to serve on the mission field and was later a prisoner of war. A lovely biography that provides readers with an example of what it can look like to honour and serve Christ.